I didn't expect the first few pages of In My Father's Country to impact me the way it did. As I read the author's initial recounting of an incident that nearly left her dead at age five, about her father shooting his pistol off in honor of her birth despite the fact she was a girl, a tradition saved solely for boys, and then his prediction that she would go far in life, I thought of my own dad. And it made me sad. I had to stop reading at that point, take a deep breath, wipe the tears away and then begin again, this time with my mind in the right place. 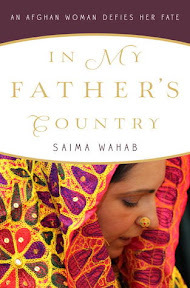 My interest in reading Saima Wahab's book has much to do with my interest in the Middle East and current events. It also stems from my love for my daughter and wanting to expose her to strong and resourceful women. She's too young to understand or even care about much of anything outside of her own family and friends right now, of course, but that will one day change. I want her to be proud to be a woman and know that she can do just about anything she sets her mind to do. Saima Wahab was born in Kabul, Afghanistan, her father a radio talk show host who stood up for his beliefs. His courage to speak out led to his arrest by the KGB and eventual death in prison. His family joined one of many families seeking refuge with relatives in a small village and later Pakistan. Fortunately for Saima, her grandfather honored her father, his son, by continuing to push for Saima's education, something unheard of for a Pashtu family. Boys went to school, but girls stayed home and learned domestic tasks, their job to take care of the home. Saima knew from a very young age she did not want to live like that, especially if it meant being under the thumb of a man. She saw the way men treated the women in their family, and Saima longed to be free and independent. In her memoir, Saima shares the story of her childhood, of becoming a refugee, of her time in Pakisan and eventual move to to Portland, Oregon. She also talks about the culture shock she endured in the process. She was fortunate to immigrate to the U.S. with her brother and sister and cousins. Still, the experience was eye opening. The uncles who had taken them in wanted the teens to fit in in terms of outward appearance, however, they were still very conservative--and at times restricting--in the home. Saima, who was sometimes outspoken, caused them quite a bit of grief, even when it wasn't warranted. In one instance, a boy called Saima to ask for help in a class. It was a completely innocent situation, but the fact that a boy called for Saima was enough to send the uncles off the handle. They questioned her reputation and accused her of things that weren't true. It was behavior like this on the uncles part that eventually caused Saima to take her leave of them, striking it out on her own. Saima always felt she was destined to do something big and she longed to return to Afghanistan to better understand the country her father loved so much. When the opportunity arose to go as an interpreter for the U.S. Army, she jumped at the chance. That experience opened many doors for Saima both career and personal wise. I came away from In My Father's Country with a sense that the author had learned much about herself during her years in Afghanistan and yet still has a ways to go. Given she's still relatively young, it's to be expected. She is very westernized in her thinking and it came across in her expectations and desires for the Agfhanis, particularly the Pashtu women. She really wasn't given much of an opportunity to interact with the native women in her position and job duties in Afghanistan. When she finally was able to sit down and have a heart to heart with some of the women, it was an eye opening experience for her. I wish Saima had been able to interact more with Afghani women. It would have been interesting to get a more clear picture of their perspective of life and the situation in their country. There was some of that included in the book; however, it was limited--and understandably so given Saima's access to who she spoke with. It would be really interesting to read something written from their perspective. I think I hoped to find some of that with Saima's memoir, but it wasn't meant to be. Even so, Saima does a great job of describing the culture of the American military and its relationship to the people of Afghanistan, both the good and the bad. She also was able to get across the difficulties created when one country enters another without understanding the various cultures or the way the country is governed. Many mistakes were made early, including using the wrong interpreters--whether by deception on the part of the interpreters or ignorance. Would avoiding such mistakes have made a difference in the growing unrest and violence? Maybe not, but it certainly didn't help relations between the two countries. I have great respect for Saima Wahab and all that she has accomplished in terms of reaching her dreams. I also admire her insight in not only the world around her but in her own personal life, recognizing her limitations and faults. I was fascinated with her various jobs in Afghanistan, both as an interpreter and later as a researcher, and enjoyed reading about her experiences. I could feel her frustrations when she hit a wall as well as joy when she was able to make a difference. Saima clearly has genuine respect for the American Armed Forces. As the daughter of a Marine, I can't help but feel a sense of pride in that. They were lucky to have her on their team in Afghanistan. I only hope there are more women--and even men--out there like her who truly want to make a difference and do it right. I hope you will check out what others had to say on the TLC Book Tours route! Many thanks to the TLC Book Tours for the opportunity to be a part of this book tour. Copy of In My Father's Country provided by the publisher. It is something special when I book reaches out and touches you that way, even though it made you sad. That is a testament to the author's writing. I have always pushed stories of strong women towards my daughter, encouraging Mulan over Sleeping Beauty even when she was little. Whether it will make a difference in the end I don't know. She is so much quieter and less aggressive than I thought she would be, but at least we give them the confidence to achieve their dreams. This book sounds wonderful and inspiring. Sandy - My husband and I talked at length about the Disney characters and which we wanted to "push" on our daughter. LOL It's so funny you mention Mulan. She's the one I told my husband we should encourage Mouse to prefer. Of course, she'll make up her own mind regardless. This is a book that I have been seeing various places, but yours was by far the most comprehensive and touching review I have read so far. It's an interesting story, and one that I would love to read at some point. I love that her father and grandfather were so proud of her, and allowed her access to education and freedoms that other women in her culture were denied. They were very forward thinking men! Fantastic review today! I really enjoyed it. Heather - Thank you! It really is an interesting story. Saima was fortunate in so many ways, and even so she lead a difficult life. I am so glad I took a chance on this book. I love immigrant stories and I love to read about other cultures and it sounds like this book hits on both of those. I'm adding it to my wish list. I hope you do get a chance to read it, Kathy! It's such an interesting story and well worth reading. It sounds like you were right with Saima every step of the way, and that says a lot about her writing ability. Thanks for sharing your thoughts on this book for the tour! Thank you, Heather J.! It was an enjoyable read. I would love to read this one. Saima sounds like a powerful role model for all of us.